Jim Harbaugh wasted no time in replying to comments made by Gene Smith regarding Michigan’s experiment in holding practices away from campus. Buckeyes coach Urban Meyer said Tuesday he had previously asserted that he’d look into the possibility of a team trip to Florida but ultimately decided it wasn’t worth sacrificing players’ Spring Break. “Somebody asked me a question, ‘Would we look into it? '” Meyer said after practice on Tuesday. “We look into everything. I can’t see taking spring break away from players. Ohio State athletic director Gene Smith had a less diplomatic response to the question of sending his squad to Florida, which is assumed to help with recruiting. Ohio State won the national championship two years ago and dominated the Fiesta Bowl this past January in addition to a dominant win against Michigan. Meanwhile Michigan is attempting to return to being national title contender under coach Jim Harbaugh but still doesn’t take too kindly to comments that they have “jump start” their program. One could argue it indeed need to be jump started after nearly a decade of mostly unsuccessful years in Rich Rodriguez and Brady Hoke. That said, I think most would say hiring Harbaugh was all the jump start Michigan needed. It’s kind of a bummer the Buckeyes weren’t willing to compete with the Wolverines on this, because it would have been pretty fun to watch them compete for the best facilities in Florida and snipe at each other from a few miles away. 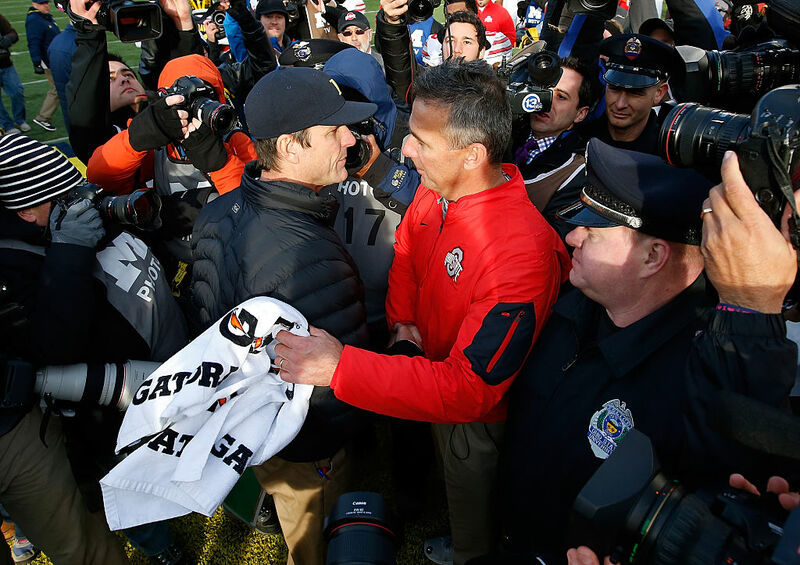 Harbaugh evoking the OSU tattoo scandal probably ratchets the bad-blood between these two schools which is pretty hard to do given the natural level of animosity between the schools and their fans.